Bestival. The Besttilllastfestival. (Apparently that's where the name comes from.) In my mind, it's because it really is the best festival I've ever had the pleasure of attending. 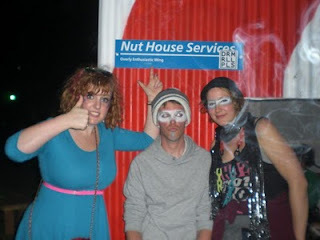 Perhaps the circumstances surrounding my Bestival trip should be explained. I've wanted to go since...oh...this time last year, and I'd planned to get a ticket if money allowed. Unfortunately, when my Aus trip was confirmed I figured that £175 for a ticket with spending money on top was probably not a good way to use my money. So I listening to my friends get excited, watched my flatmate get his fancy dress sorted and tried to use the dismal weather forecast to make myself feel better. My lovely friend Helen, however, came into some luck. When she went to buy a last minute ticket on the Friday the seller refused to take her money, and instead handed her two free tickets and told her to have a good weekend. Being the absolute diamond that she is, I got the option of nabbing the free one. However, this meant ditching my other lovely friend Pete who was down for the weekend; after I ummed and ahhed for about two hours I think he got sick of me anyway and insisted I go (it turned out pretty well for him anyway...). didn't have wellies, fancy dress or..well...anything else you probably need for festivals. I'd planned on sleeping for the entire journey, but got chatting to a lovely couple who thankfully were also attending (and knew what they were doing) and helped me find my way to the festival site. We were all getting the hovercraft, and I was very excited. However you can't actually see much so while it looks pretty cool, it feels like you're on a very bumpy train. Getting the ferry back way way more fun, even with a hangover. I arrived just as the heavens opened and poor Helen got soaked coming up the massive hill (if you've been then you'll know!) to meet me with *the ticket*. Then it was straight to the orange overflow campsite to give everyone a nice surprise...ME! Thankfully everyone seemed happy to see my face, and once the tent was up and we'd smeared our faces with glittery paint we were off. The evening started with The Cure who were OK, but really not as good as I expected. We decided to sneak off and catch most of Annie Mac's set. Again, she was ace but not mind blowing. Still, Helen and I happily raved about in the mud until we found a worse-for-wear Frazer being propped up by Zena. We wound our merry way around the site, investigating anything that took the interest of Frazer the puppy (little 'in joke' for you there). This eventually led to us finding ourselves in a Wedding Disco, which was bloody amazing. At about 2am we decided to head back to the tent. Exhausted by our long days (and nothing to do with alcohol at all) we fell to sleep pretty much instantly, safely snuggled in our small-but-perfectly-formed tent. Sunday started with breakfast (which included potato salad...I've no idea either), face paints and cider. We started with the Drums on the main stage. I'm not a huge fan but I did enjoy their set, though with last-day-of-the-festival atmosphere building I would've danced to anything. Kelis was on afterwards, and was a really great surprise. I'm not a 'fan' fan, but I'll dance to milkshake with vigour after a few ciders (as you do). However she really was great, and played a blinding set. Talking to others it seems they were as surprised as me! Bravo, Kelis. And not just for the snazzy top hat/corset combo. We pushed up the hill and through the crowds to nab a decent spot for Noah and the Whale in the Big Top who (luckily) lived up to the hype (although, my favourite moment came before they came onto stage when an orchestral cover of Bohemian Rhapsody lead to an enormous sing along. Honestly, sometimes the DJs between sets at Bestival were more fun than the acts themselves.) Anyway, NATW were brilliant. They commanded the crowd and proved why they're achieving so much success. Top notch. After finally locating my flatmate Ash we headed to Robyn via a few campsites, arriving just in time to hear Call Your Girlfriend and Every Heartbeat. (Frazer insisted on staring at me lovingly throughout the latter, and then made me go all weepy with his drunken sentiment. Thanks Fraze.) Despite the cider-induced emotion I really enjoyed Robyn. She's got a cracking voice and everyone in the crowd seemed to be having a good old dance - pretty much the opposite of The Cure. Now we had to wait for Bjork, an act I'd been pretty skeptical about. My main memory of her is basing my GCSE art piece on her 'fashion disasters', mimicking the Warhol disaster series (I got a C). But, my God, that freaky Icelandic nut job was insanely good. Perhaps it was the David Attenborough intro; perhaps it was the crazy choir that joined her on stage. Whatever it was, it worked. On that Sunday night in a field on the Isle of Wight, everything about Bjork suddenly made sense. When we'd finally dried our eyes, we decided to follow Ash to the Rizlab where we were excited to find there were FREE PONCHOS to be had. Quite lucky, given how hard the rain had started to come down. Still, at least we look pret-ty coooool in them. 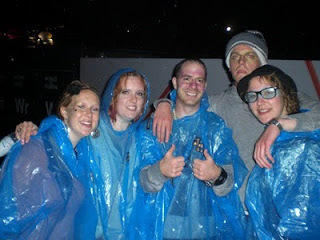 Rather quickly the rain became a little too wet and we escaped to the covered safety of the Big Top and Mr FatboySlim. Some of us (Ash) were sceptical about how good he'd be. Some of us (me) were confident that it would be beyond incredible. Of course as we all know, women are always right. 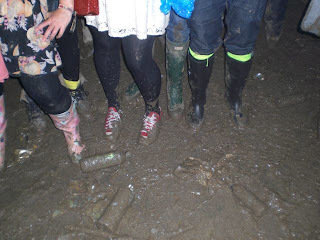 It was blissful, even though the converse/mud combo made it nigh on impossible to dance properly. There was a moment when everything faded out, leaving only the voice of Liam Gallagher singing 'wonderwall' blaring over the crowd as we all tried to join in. It was magic - who would've thought that the best part of a dance set would contain nothing but a vocal track? I also never thought waltzing in the mud to classical music at 2am on a Sunday would be a good way to finish off the festival. But, somehow, it seemed fitting. I'm not going to pretend that getting back on Monday was fun, or that the thought of a hot shower and toilets with a sink to wash your hands in didn't almost make me weep with happiness; that weekend was probably one of the best I've had. This is the first time I've not cut off my festival wristband the second I've got home, and that's got to tell you something. So thank you Helen, and the lovely man who gave her the free tickets. Thank you Pete for letting me ditch you (with love in my heart). Thank you to everyone in our camping group. And thank you Rob de Bank, for masterminding the whole Bestival idea.